Our refrigerators might possibly be the most overlooked area in our home when it comes to cleaning. Constantly in use, this essential appliance doesn’t usually get a second thought. Whether we just don’t think about it at all, or assume that because food is kept cold or rotated through, that the fridge stays relatively clean, the truth is that cross-contamination, spills, splashes and all sorts of disgusting things I’d rather not talk about can spread throughout the fridge in this perfect storm of moisture, food, dirty hands and frequent use. Believe it or not, a messy fridge is also costing you money. When our refrigerators become so full that we can no longer find anything, we are in serious danger of wasting a lot of food, from forgotten leftovers hidden behind the milk to produce that goes bad before we remember it is there, to condiments that have been expired for years still taking up space. And it’s not just the food waste taking a bite out of your budget. Surprisingly, your fridge can increase your energy bill by a LOT. Peak efficiency requires plenty of air circulation, clean coils, and clean seals that are tight and working properly. 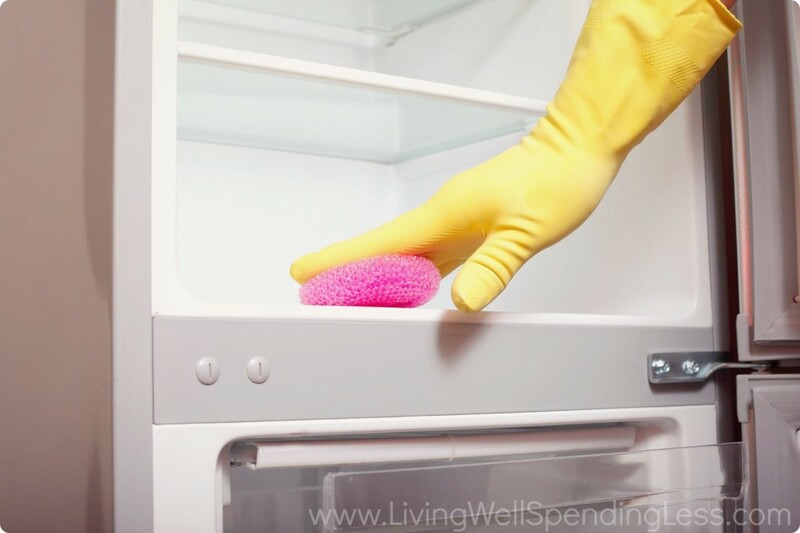 You can boost the efficiency of your fridge and lower your energy costs simply by keeping things clean. 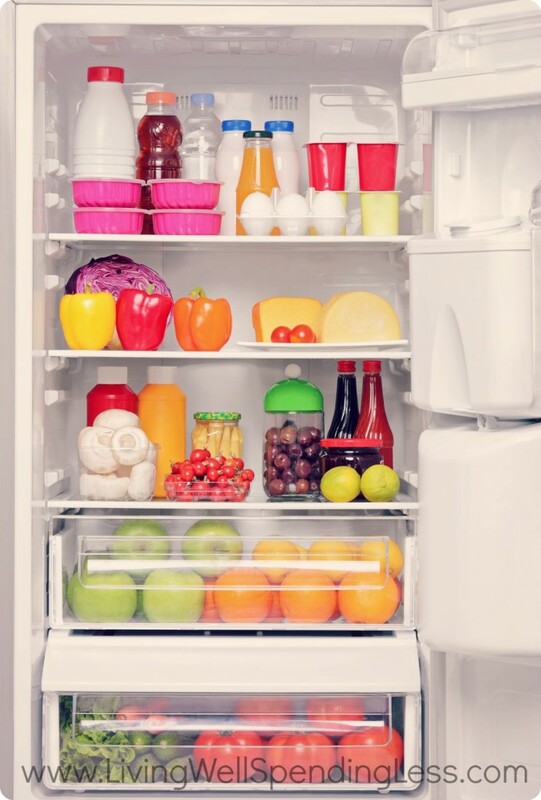 If it’s not already, your refrigerator should definitely be added to your regular cleaning list. Your weekly fridge duties should include wiping down the surfaces, disinfecting the door handle, and carefully rotating food as it gets older to prevent spoilage. Food should be properly stored in covered, clear glass containers that can be easily identified and cleaned. Wipe off lids, put a paper towel under items that are likely to drip, and pay attention to dates and ages. Be sure the fuse or circuit breaker to the outlet is turned off, then unplug the fridge. This ensures your safety any time you’re using water around appliances. You may also want to be sure that you put down a towel to protect floors from any spills (especially if you have wood flooring in the kitchen). Place items in the cooler. Check dates on everything and toss anything that’s expired. Be merciless with your purging. If it’s close to the date and your family will never use an entire bottle of pickle relish that you purchased for ONE recipe six months ago—toss it out. Over a towel, wipe each shelf carefully with the water/baking soda solution (it absorbs odors). For stubborn crusties, use a butter knife or putty knife to gently loosen the gunk. Use your spray or a cloth dipped in the cleaning solution. Thoroughly wash the built-in fixtures, the bottom of the fridge, and the nooks and crannies of the door. Be sure you get in the cracks and under the shelving. Your butter knife may come in handy again here to get in some of the cracks where crumbs and food particles tend to collect. Make sure the inside is fully dry and clean before replacing the shelves and bins. You should wipe each bin dry with a soft cloth or paper towel. One of the grimiest areas of the fridge is the door seals. They have little folds that can collect debris, crumbs and at the very worst, grow mildew and mold. Be sure to clean them very thoroughly and dry impeccably. This will prevent mildew and keep the seal tight and working at maximum efficiency. Carefully pull the fridge out from the wall and vacuum the coils to remove any dust that may have collected. Carefully remove the kickplate or grate from the bottom of the fridge as well, and do the same. Some fridges (particularly if the freezer is side-by-side or on the bottom) may have a drip tray or pan. If this is the case, remove the tray and clean as you would the shelves, then replace. Take care to secure each lid and wipe the tops and anything sticky, before putting it back in the fridge. Put items like meat and seafood on the bottom to protect any spills from spreading. I like to put a folded paper towel in the drawers and under liquids (milk, juice) to absorb condensation and keep things extra clean. Add an open box of baking soda to absorb odors. Most freezers these days don’t need a defrosting, just a simple cleaning will do. Due to the perishable nature of freezer items, you must work quickly when you organize the freezer. First, remove items and store in the cooler. Check expiration dates. Anything you don’t immediately recognize and anything with ice crystals or freezer burn on the inside (I’m looking at you, half-container of ice cream)—get rid of it! Check things that are frozen in a solid mass, such as vegetables or fruit. This is an indication that they’ve been thawed and refrozen, so they should be discarded, due to food borne-illness concerns. Wipe it all out just as you did in the fridge. This is usually a much faster job, but be sure to wipe baskets and shelving carefully. Organize like-items together, stack boxes and keep less-perishable items like frozen vegetables in the door. Move meats and fish to the back and on the bottom. Taking care to organize your fridge and deep clean it every season can ensure you have plenty of extra storage space. You’ll save money because you won’t be re-buying things you didn’t realize you had buried in the back of the fridge. Plus, your fridge will work more efficiently and be more cost-effective. Most importantly, though, having a clean fridge will help keep your family healthy and safe! I confess I came to this article feeling a little smug. I felt quite confident that my sparkling fridge would give me no cause for concern. I give it a good wipe around weekly just before my shopping trip – as I’m emptying anything that needs to be chucked (I know I know, there shouldn’t be much of that – and there isn’t!). Anyway, I never even considered pulling the thing out and cleaning and vacuuming the vents and so on… just never crossed my mind! I guess I’ll be doing that at some point in the next couple of weeks. Having pets it’s essential to vacuum the vents on a regular basis. I never knew this until one day my refrigerator wasn’t working so well. The repair man gave me this handy tool (basically a long flexible stick with fibers that catch the lint and fur). I regularly vacuum under the refrigerator now, usually once a month. Also using your dishwasher to wash the shelving units and drawers is great time saver. Great tips! I actually love cleaning out my fridge. I feel like the food does not go to waste when I can see everything! Now I need to go clean my fridge. 🙂 Thanks for the inspiration. I’m in awe over how few condiments there are in that fridge. haha. Looks like I may need to simplify. I try to clean the interior really well once a month, but it’s rare that I tackle the freezer. Thanks for the reminder! I love the idea of vacuuming the grate. Why I have never thought to do that, I just don’t know! It’s time for me to do this RIGHT now. It always seems that after a few weekends out of town a few weeks of just trying to keep food in the house and catch up on everything the fridge is totally out of sight and out of mind. I’m going to put this on my to-do list this week. I keep a small dish of baking soda in my fridge door to keep things smelling fresh. Thanks for sharing! This is great! Having a checklist helps so much when you’re teaching a teen how to deep clean. I’m the worst about getting the fridge empty and starting the wipedown and then realizing, as I’m replacing the food, that I forgot something (like the seals!). Food waste makes me nutty. Thanks for posting. Hello from Thrifty Thursday. because the fridge is busy, that does not mean we should not clean it. ot is necessary to clean fridge on daily basis. You are absolutely right that the dirty fridge is a health hazard and there often is food that has been forgotten there for weeks or even months! Cleaning the fridge is very important but it is often postponed because it take so much time and energy to do it. I am planning to start with deep cleaning my fridge this Saturday! I will definitely follow your tips! The post is incredibly helpful! Thank you! I put press-n-seal down on each shelf. Then if there is a spill all I have to do is pull it up and put down a new sheet. No scrubbing needed! I wipe the inside of my fridge out with vinegar…as it is as good as bleach for disinfecting. I also take all the shelves out and of the door and inside and wash them in the bathtub. Much bigger than a tote. Also watched on Dr. OZ TO USE A Qtip with bleach to clean around the seal where all the crumbs, dust and what not sure are. Any tips on how to clean a bottom mount freezer? Mine is a pull out drawer with storage in the bottom. There is also a slide out storage tray above the lower storage. I have a spill under the bottom baskets, but cannot figure out how to get in there to clean it. They don’t lift out or pull out like the refrigerator racks and drawers. I just wanted to thank you for these tips on cleaning a fridge. I’m glad that you mentioned to clean the door seals, especially since it can be one of the dirtiest areas. That being said, i’m kind of interested in learning what some tactics are that people use to make sure that area is as clean as possible. I definitely have mold between the refrigerator and freezer seal. I also have mold on one of the bathroom ceilings, but that is for another day. I have been putting it off. This chore hasn’t been done since at least late 2013, when I came up here to take care of my Late Father )-:. My issue is that the shelves don’t fit in a standard sink. The relatively new laundry tub in the basement is full of decaying lint-so that would be going from the frying pain into the fire. I could use the bathtub, or even hose it off outside (there isn’t too much dog dirt out there-I don’t have one.) It’s the same issue (on a smaller scale) with my electrostatic furnace filter. 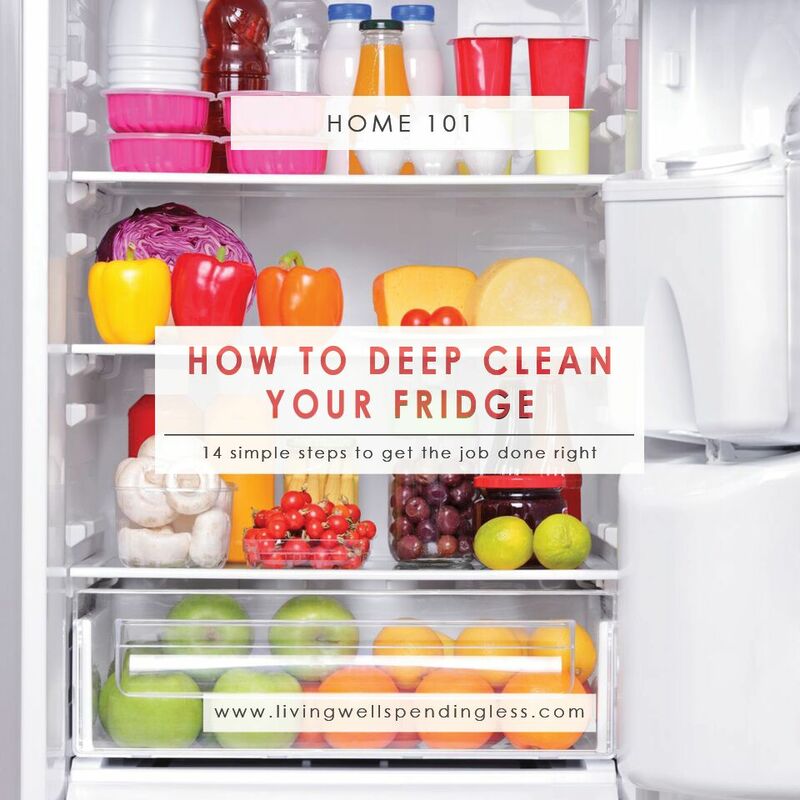 An brilliant idea in cleaning the refrigerator without any hassle, it was easy to understand and very detail to it’s tips. Thank you for the great blog! I use white vinegar instead of baking soda and my shelves shine and shimmer! My boyfriend cleaned my fridge today while I was at work. It was a total condiment purge situation. When I arrived home, he recounted some of the fungal highlights and described in detail the delicate process of possible botulism vector disposal. I miss the old honey mustard. And the horseradish. Still, he gets major points. However, he did not touch the freezer. Also, my fridge does NOT look as organized and color coordinated as the one pictured in this article. He filled the newly empty space with chocolate chip cookies. In the fridge. Cookies. His hands are soft and supple without the use of yellow gloves. SO cool. If you don’t clean the condenser coils at the back side from dust and pet hair, it can destroy the air flow in the fridge: https://abc-repair.com So always clean up debris. 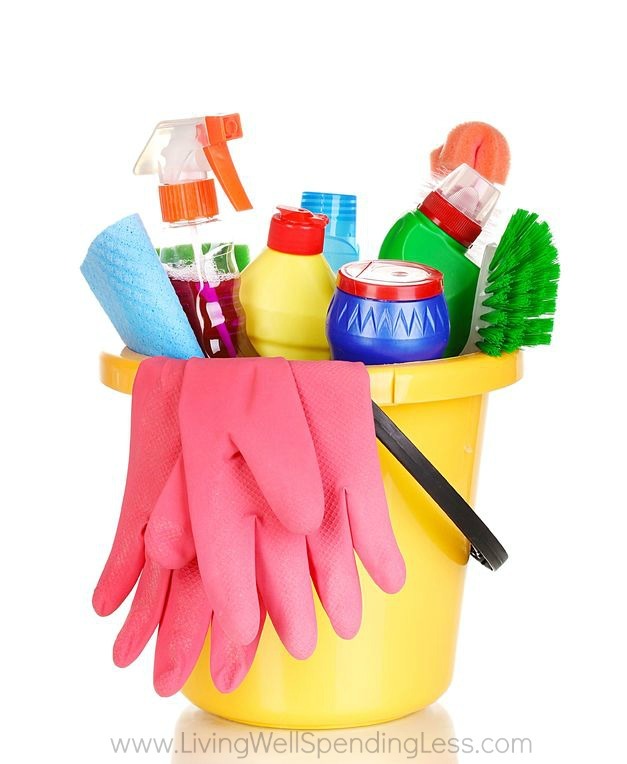 Not cleaning can cause strange noises made by fans motors or your refrigerator can even stop freezing. thanks for the shout out and keep up the great work! Before removing shelves I make note of where they are inserted so that I replace them to the height that is best for how I organize my food in the frig.